Westerners instinctively think that the worst effect of global warming is the melting ice cap of the North Pole. We tend to reserve the other effects of global warming for developing nations. But now that politicians also have woken up to the fact that we’re already halfway down the path toward causing a 2 degree rise in temperatures by injecting some 520 billion tonnes into the atmosphere, it’s time to reconsider. Even the richest nations are not going to escape freak weather, droughts and increases in infectious diseases. These effects are already firmly rooted and they tell us that conditions tangibly affect all and bring the issue ever closer to home. Peter Mertens, a UK scientist, warns that African Horse disease, a virus that’s closely related to bluetongue, has a strong chance of making it to Europe due to warmer temperatures. Both bluetongue and African Horse disease are orbiviruses, part of the reoviridae family. Mertens, who is attached to the Institute for Animal Health in the UK, pointed out that the surprise arrival of bluetongue virus serotype 8 in 2006 in Belgium and Holland ought to be a wake up call and that Europeans should be alert for its more deadly sibling, African horse disease. From the routes taken by the biting midges, Culicoides imicola, which spread the bluetongue in Northern Europe, it is clear that the virus is a tangible effect of global warming. What´s more, the disease can be spread by labs working with bluetongue virus strains. 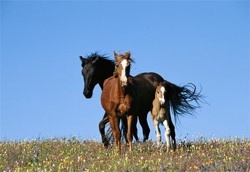 That means that it is also a risk to horses in the United States. The 2006 outbreak of bluetongue took place when temperatures in The Netherlands were six degrees higher on average than preceding years. Shortly after the midges had delivered the bluetongue virus in Holland and Belgium for the first time ever in Northern Europe, the disease spread in rapid pace to other European countries. It then did another surprising thing; it survived the 2006-2007 winter, by an unknown mechanism. Yet, that particular winter was the also the second mildest winter in Northern Europe on record. By 2007 the disease, which affects ruminants, had still not been contained. Over 2 million ruminants, mainly sheep, were killed. Despite the huge number of fatalities, bluetongue is only a nuisance compared to African horse disease, which is considered the most lethal infectious disease in equid, killing more than 95% of its victims. African horse sickness was diagnosed in Spain in 1987-90 and in Portugal in 1989 and was eradicated using slaughter policies, movement restrictions, vector eradication and vaccination. Mortality levels in bluetongue are lower than those in African horsesickness (20-50%) and vaccinations are highly efficient, reducing the levels to 1-2% only. An article entitled African Horse Sickness: A Threat to the United States? in The Horse, assesses if African horse disease is endangering the US. The authors of the report say the biting midges are unlikely to make it across the Atlantic. “The shortest distance from Africa to the United States is 3,000 miles (4,830 km). To cover such long distances, transport would need to be at high altitude (3.5 miles; 6,000 m), at which air temperature is far below 32° F (0° C), and Culicoides spp. would not survive”, writes William R. White, a veterinarian and Timothy R. Cordes, a National Equine Program Manager in Riverdale, Maryland. But they warn that the disease might still find its way in by means of lab vectors because the disease is very closely linked with bluetongue. Bluetongue has been around in the US since 1948 and recent outbreaks have been reported in 18 states. There are other diseases with equally harrowing potential scenarios. The Wildlife Conservation Society (WCS) warns that future outbreaks of avian influenza, Lyme disease, Rift Valley fever, parasites, ebola, babesiosis, cholera, plague, sleeping sickness, tuberculosis, yellow fever and poisonous algal infestations known as red tides should be expected. The organization recently released a study in which it analyzed how pathogens will “benefi”‘ most from the changes in the climate. Entitled The Deadly Dozen, Wildlife Diseases in the Age of Climate Change (pdf) the report predicts that there are risks for human health and that a large part of the risks can be studied by closely monitoring animals and wildlife. The spread of diseases has an economic dimension which makes global warming, once more, undesirably tangible. Since the middle of the 1990s, the costs associated with bird flu and other new infectious diseases have amounted to some $100 billion, numbers in the report indicate. Steven Sanderson, the president of the WCS, says that the health of wild animals is tightly linked to the ecosystems in which they live. “Even minor disturbances can have far-reaching consequences. Monitoring wildlife health will help us predict where those trouble spots will occur and plan how to prepare,” Sanderson commented.